Bakersfield, CA — Terri Palmquist noticed an ominous change at the FPA Women’s Health abortion facility in Bakersfield, California, where she regularly stands vigil to pray and offer practical assistance to abortion-bound women. It was October 3, 2017, during their “LifeVigil” prayer campaign organized by Terri and her husband, Tim. She watched as one woman was helped into the abortion facility doubled over in pain, as if she was experiencing the severe cramps of labor – something with which Terri was well familiar as the mother of eleven. It seemed this woman who struggled to walk was experiencing some kind of complication from a recent abortion. Terri had seen her share of women suffering abortion complications as well, having ministered outside the same high-volume abortion facility for nearly three decades. She had remained throughout the years and watched as one abortionist after the other was hired, then moved on, leaving a trail of frequently injured women in their wake. 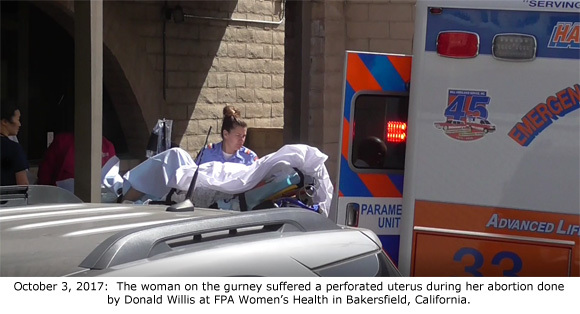 But the man who has been conducting abortions at the Bakersfield FPA abortion facility since the beginning of the year, Donald Clyde Willis, seemed to be among the worst she had ever seen. Up until then, he had sent five abortion patients to the emergency room for treatment of serious complications. Later that morning, Terri spoke to the mother of another woman who was inside getting an abortion at four-and-a-half months into her pregnancy. The mother explained that her daughter had “seaweed” inserted the day before. Suddenly, Terri understood what was happening. Willis was now doing more expensive second trimester abortions, upping the previous gestational limit that for years topped out at end of the first trimester. But Terri also had a gut feeling. An abortionist with a horrible safety record doing the riskier and more difficult second trimester abortions was a recipe for disaster. At 1:30 p.m., she told her husband Tim, her partner in ministry, that he needed to get ready for an ambulance. Her instincts were spot on. Just 17 minutes later, at 1:47 p.m., an ambulance arrived at the FPA Women’s Health abortion business, followed by a security vehicle from the Adventist Health hospital two blocks away. A woman covered completely by a sheet was brought out on a gurney and loaded into the awaiting ambulance. But something wasn’t right. The ambulance didn’t leave right away. Both EMTs appeared to be in the back of the ambulance treating the woman for several minutes before finally making the short trip to the emergency room, where Tim was waiting, camera in hand, thanks to Terri’s early warning. When the gurney was pulled out of the ambulance, her head was no longer covered. Tim’s video clearly showed a young light-skinned woman wearing an oxygen mask attached to an oxygen source under the gurney. The obstetric position in which she laid, with her knees up and legs slightly apart, was unusual. Was that blood under her on the gurney? This wasn’t the same woman who had earlier struggled to walk into the abortion facility, nor was she the woman who completed a two-day abortion that morning. She was the sixth Willis patient to be transported by ambulance to a hospital emergency room this year. Tim Palmquist told Operation Rescue that he learned more about what happened. He said the patient was a 23-year old Hispanic woman whose uterus was perforated during the abortion. Once at the hospital, she suffered cardiac arrest. Her heart reportedly stopped for five minutes before doctors could revive her. Her injuries were so serious that she received an emergency hysterectomy. Currently, the woman is recovering in the Intensive Care Unit at Adventist Health. Willis is a suicide survivor with documented mental health issues that caused Alaska to demand his medical license surrender. He moved to California from his home in Oregon to evade the permanent restrictions imposed on his medical license after the suicide attempt that included strict monitoring and routine appointments with a mental health professional. He also has a history of financial difficulties, having declared bankruptcy in 2010. Below are brief summaries of his other abortion-related misadventures that forced the emergency hospitalization of Bakersfield area women this year. Visit LifeVigil Bakersfield’s Facebook page.